I hate to say it. But there is no one best type of grill. Well, there is one best grill, but you won’t read much farther after learning the $14,000+ price tag. 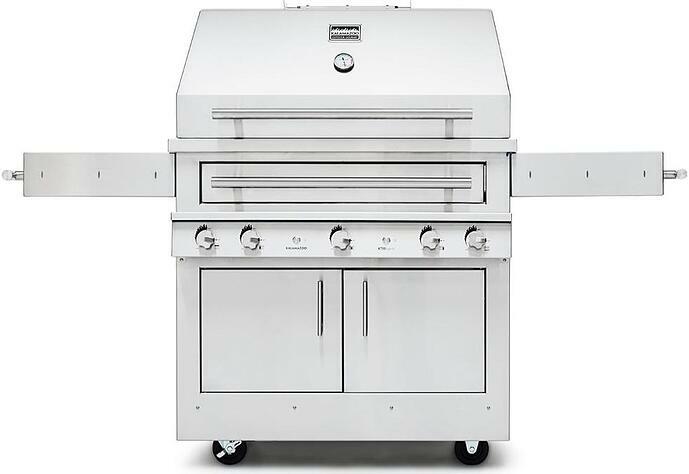 What type of grill is the best to buy? You do now have more choices and brands for grills than ever. 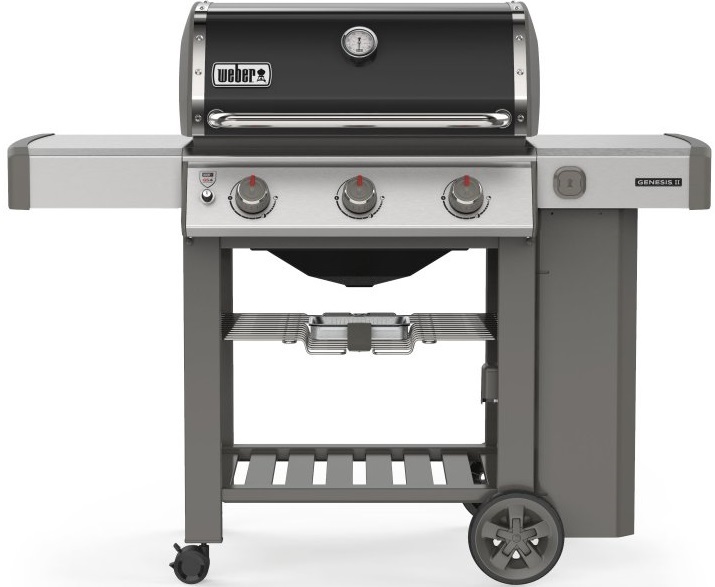 You can buy Weber, Char-broil, Napoleon, and MHP for a value type of gas grill. 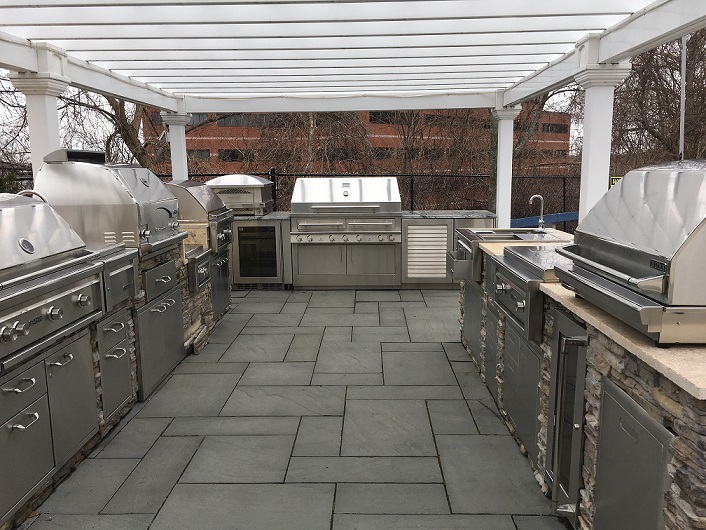 If you like better output, infrared sears, smoker options, and rotisserie, then Lynx, Hestan, DCS and Kalamazoo are great choices. You may like a smoker or the ability to infuse flavor. Pellet is another type of outside cooking using wood pellets for heat and flavor. 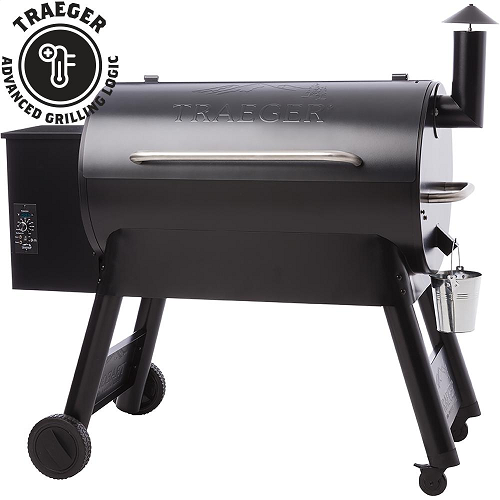 Traeger has been the name for pellet style grills. But be careful, many people are oversold on pellet styled, so we will set expectations properly in this article. Charcoal is the last type of grill. The $199 Smokey Joe was my first, and nothing beats charcoal for texture and smokey flavor. Most professional grill competitors use a mix of wood and charcoal for a reason. Since there is no best grill, I will show you the advantages and disadvantages of each. In the end, you will understand what type of grill is right for you and your family. I will also briefly cover brands briefly as well. You can read about brands more in-depth in other articles. “Our wood pellet grills use an auger to move hardwood pellets from the hopper to the firepot within the grill. The higher the set temperature, the more pellets dispensed into the auger. Basically, you will load the hopper with your favorite pellet flavors. 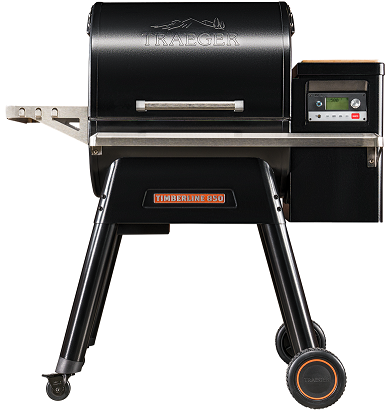 The grill creates an even convection heat ideal for smoking and lower temperature cooking. First, you can add flavor in a way you cannot in gas. The thermostat is set for 5-degree increments, so unlike grills, you can keep a more consistent temperature without maintaining constant vigilance over your grill. You also do not have to open, check and turn the meat over like a gas grill. Their Wi-Fi works. You can be notified through an app on your phone. 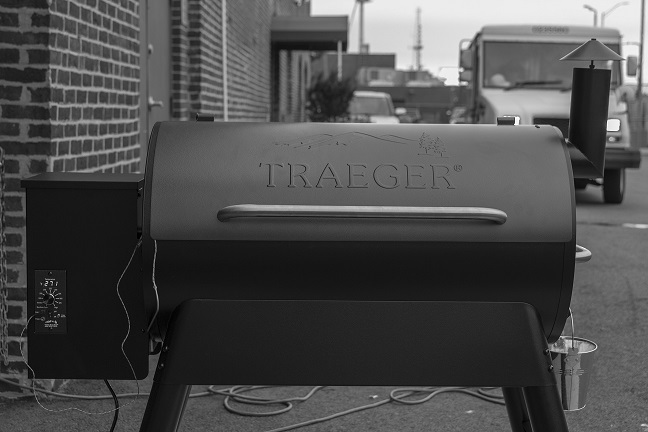 If you want to quickly throw a burger on before the game, then Traeger is not the right product for you. The max temperature to a Traeger is 500 degrees not 900 like a gas grill. Consequently, you do not have the “char”, speed and searing capabilities of a gas grill. Traeger is a good product if you understand its not a grill. It more of a smoker with an ability to cook like a convection stove. Charcoal is the best grill for adding smokey flavor. It can also be completely portable in many grills. I have owned a few grills, and nothing beats charcoal for texture and smokey flavor. 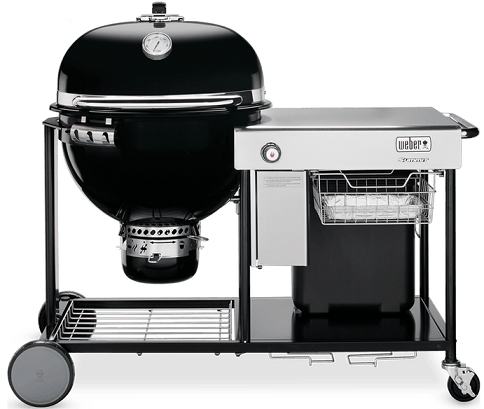 The Weber Charcoal Summit is a large charcoal grill and has a small LP tank to start the coals quicker. Charcoal grills require supervision. You have to add charcoal, build it up properly and constantly watch your food. Like a pellet, it is not fast, so plan that burger well before game time. Gas grills are easy. They can reach high temperatures and can be regulated easily by simply turning the knob. They are simple to use. You can cook that burger quickly and evenly. It is simple to use and pretty durable as well. You have speed but gas lacks texture and flavor of either the charcoal or pellet style grills/cookers. 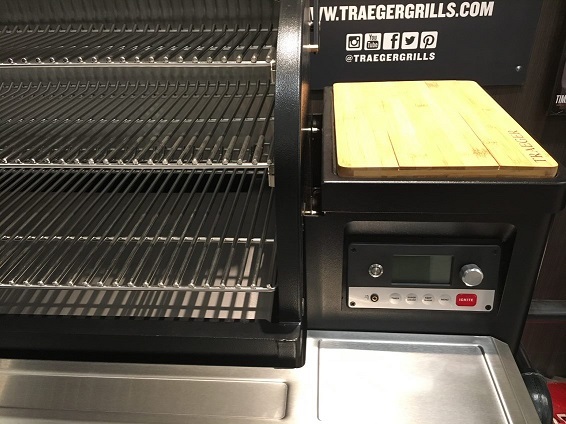 Instead of 6,000-10,000 BTU per burner, a pro grill will have 23-29,000 with solid stainless construction and a load of extras like infrared sear, rotisserie, charcoal trays and smoker baskets. You can cook a lot very fast. You can use the rotisserie up to 50 pounds in one of these grills. Infrared searing is a more direct, intense heat to sear the fastest. You have smoker baskets to add smokey flavor as well. However, Kalamazoo is the best with a hybrid drawer system, so you can cook with charcoal, wood, and gas. However, Kalamazoo starts at 13,000 and has a 4-8 week lead time in the season. It is expensive…..You can do more, but the price starts at $5,000. The flavor and the texture is still better in the other grills. 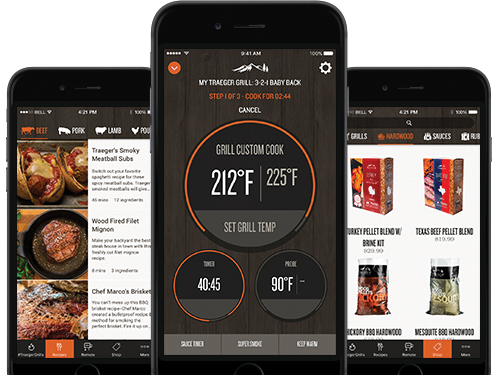 Unlike appliances currently, Wi-Fi has value for grilling. You do not have to be tethered to a grill anymore while entertaining. 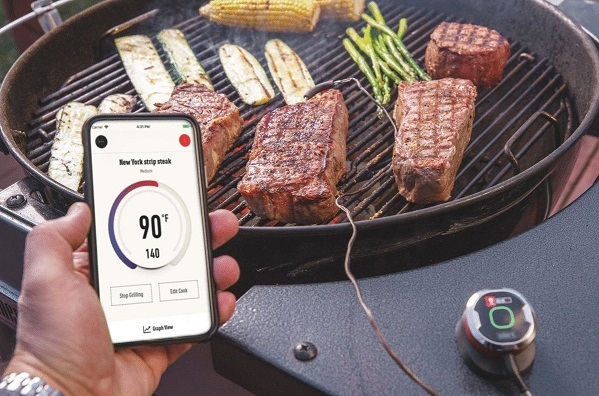 The Traeger Wi-Fire and IGrill from Weber allow you to receive alerts on your phone rather than standing over your grill. It depends. There is value in all types. Pellet is more like an outside range. It allows you to add any number of flavors and is consistent in temperature. You can set this grill in the morning at a low temperature and have your food done in the evening for dinnertime. There is nothing like food from a charcoal grill for texture and smokey flavor, but you have to watch it consistently and load it every time properly. Gas is about speed, searing, and char, but not necessarily added flavor. Pro ranges have some of that ability but at a much higher price. So what you should buy depends on how you will use it and cooking preferences. You do have good options in any style. 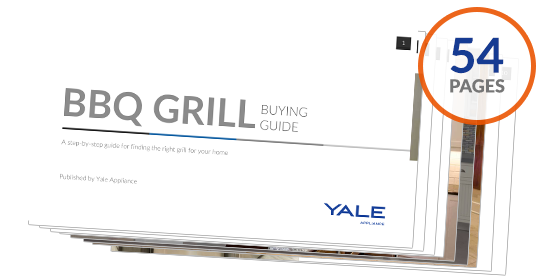 Get our free BBQ Grill Buying Guide for reviews of all the major brands. Over 510,000 people have already found answers in a Yale guide.